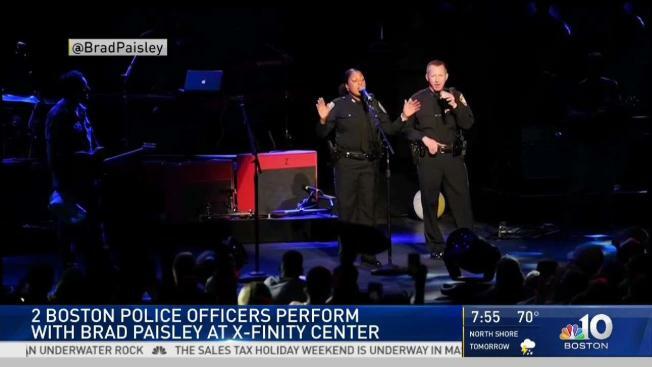 Two Boston Police officers famous for their rendition of "God Bless America" got the chance to perform with Brad Paisley at the Xfinity Center in Mansfield on Saturday. Paisley invited officers Stephen McNulty and Kim Tavares to sing at his Massachusetts concert after seeing their viral "Cop Pool Karaoke" video earlier this summer. The video is a spoof of "Carpool Karaoke," a segment on "The Late Late Show with James Corden" where musical guests join the host for a joyride as they sing along to their own music. On Saturday night, Paisley welcomed the officers on stage where they sang "God Bless America," a capella, to cheers from the country music crowd. After his concert, Paisley posted the officer's live performance on Twitter. While McNulty and Tavares gained attention online for their elegant and powerful voices, the officers said at the time singing on job is therapeutic for them. McNulty, a third generation officer who joined the police force in 2006, used to be a professional singer for the Boston-based a capella group Ball In The House from 1996 to 2004. Tavares, a 17-year veteran of the force, writes her own songs and has been singing for as long as she can remember.